Astrology, Signs, and Planets on StellarDays.com | Basics | What is Retrograde? When we have to change our minds about a person, we hold the inconvenience he causes us very much against him. Retrograde and Direct motion refer to the fact that the planets appear to be moving either in the same direction around the Sun as planet Earth, or in the opposite direction. This is an apparent motion because it is not what the planets are actually doing in their orbits, but what we see from our perspective here on Earth. 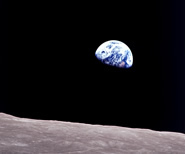 A planet is said to be moving in Direct motion when it appears to be moving in the same direction that Earth is moving. When it appears to change direction and move backwards, it is said to be moving in Retrograde motion. 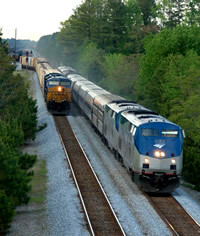 The most common example given to help you visualize retrograde motion is that of two trains passing in the night. This puzzled me for years, as I always imagined the trains going in opposite directions, meeting head-on. No one ever told me I was supposed to be thinking of these trains as going in the same direction!! Think of yourself driving down the highway as planet Earth and the car in the next lane as the planet turning retrograde. 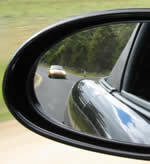 When you are passing this car, you are first racing to catch up with it. Then, for a time you are traveling alongside each other at a similar speed. As you drive past, the other car appears to stop for a brief moment, then quickly drifts backwards in the rearview mirror. And finally, it appears to resume moving in the same direction that you are. Of course, when we're talking about planets, all this doesn't happen in 20 seconds. It takes weeks or months. When a planet turns retrograde, there is a gradual slowing down of it's motion until it seems to stand still for a short time. Then there is a gradual increase in speed as it heads backwards. At the end of the retrograde period, the process is reversed as the planet again turns direct in its motion. It's like that car you just passed starting to catch up with you again. Imagine driving down the highway and suddenly you see a road block up ahead. You slow down, you stop, you turn around, and you go back where you just came from. That's what Retrograde is like. The energy associated with these changes of direction varies from one planet to the other, but in general, the interests represented by the planet turn inward. It's a time to think and ruminate and maybe even work hard. The most noticeable thing during these days is that things related to the planet in question just stop working the way they are 'supposed' to. Things get broken, communications get lost, feelings get hurt, people get frustrated. It's usually a good time to work on old projects that have been put on the back burner for a while. Sometimes people you haven't seen for a long, long time reappear too. The effect is most intense a few days before and after the station. Once the planet gets rolling in the new direction, things do smooth out. But the focus changes, though, and so will you -- you'll be going in a different direction, so to speak.